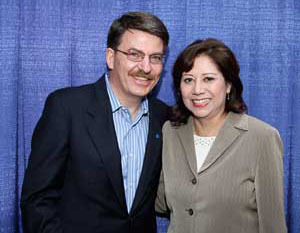 Kenneth Burt with Secretary of Labor Hilda Solis. 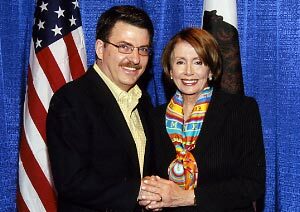 Kenneth Burt with then House Speaker Nancy Pelosi. Kenneth Burt and Congressman Edward Roybal at the Community Service Organization's 50th anniversary celebration in Los Angeles. 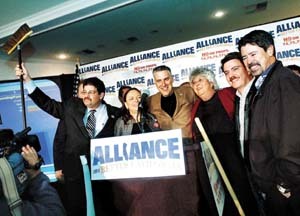 Kenneth Burt joins other California union leaders on Election Night 2005 after turning back four misguided voter initiatives. 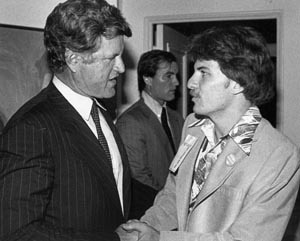 Burt began his public service career as an Edward M. Kennedy delegate to the 1980 Democratic National Convention in New York. 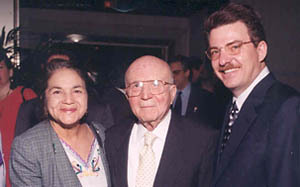 Burt with UFW cofounder Dolores Huerta and Gus Hawkins, the first African American member of Congress from California, at the 50th anniversary celebration of the state's Fair Employment Practices Act, sponsored by the Jewish Labor Committee in 1999. Kenneth C. Burt is the political director of the California Federation of Teachers and the author of The Search for a Civic Voice: California Latino Politics (2007). A longtime visiting scholar at the University of California at Berkeley, Burt graduated from Berkeley and Harvard University. He has chapters in numerous anthologies relating to Latinos and politics, labor, and the Cold War. His book, The Search for a Civic Voice: California Latino Politics, has received accolades within academic circles and in the press. Burt's new blog focuses on national Latino political history starting in the 1930s. Burt celebrated the new spirit of hope in the United States by attending the Inauguration of President Barak Obama. After the swearing-in, he dined with U.S. Senator Barbara Boxer and other political leaders from California, before attending that evening's Western Ball featuring Marc Anthony and Jenifer Lopez. As CFT political director, Burt represents more than 100,000 educators, including college professors. He oversees the union's effort to elect pro-education, pro-working, family candidates. He helps lead voter initiative campaigns, and works closely with affiliates, and community allies. For more about the California Federation of Teachers, visit the CFT website. The son of two teachers, Burt started his public service early. While still an undergraduate at the University of California at Berkeley, he was an Edward M. Kennedy delegate to the 1980 Democratic National Convention in New York. That summer Burt also worked as a $10-a-week volunteer for the United Farm Workers and attended the convention with Dolores Huerta. Burt attended Harvard University's John F. Kennedy School of Government and worked in the the nation's Capitol with Congressman Robert T. Matsui. In Sacramento, he worked for Assembly Speaker Willie Brown and Insurance Commissioner John Garamendi, among others, before accepting the post as CFT's first political director in the late 1990s. Burt regularly publishes academic papers and presents at conferences. His essays appear in six anthologies used in college classrooms. 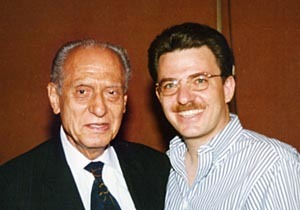 The Historical Society of Southern California honored Burt with its prestigious Doyce B. Nunis, Jr. Award in 2004 for his article, "The Power of a Mobilized Citizenry and Coalition Politics: The 1949 Election of Edward R. Roybal to the Los Angeles City Council" in the Southern California Quarterly. Burt served as the on-air academic for a PBS mini-documentary on Latino veterans. The program aired nationally as Realidades: Los Soladados Americanos, in August 2002, with the award-winning program, "American Family," staring Edward Olmos and Rachel Welch. The documentary was particularly meaningful because Burt's father-in-law, George R. Sotelo, helped organize the American G.I. Forum in California in the 1950s. About the same time, Burt served as a consultant to the Boyle Heights Project, a multicultural museum exhibit at the Japanese American National Museum. The exhibit looked at an iconic Los Angeles neighborhood from the 1930s to 1950s when immigrants from Mexico and Japan and Yiddish-speaking Jews lived in close proximity with other white ethnics and African Americans. Burt believes it is important to recognize social justice pioneers. In 1997, he was the sole academic on the committee for the 50th anniversary celebration for the Mexican American-oriented Community Service Organization (CSO) in Los Angeles. Two years later, Burt helped organize the 50th anniversary celebration of passage of California's Fair Employment Practices Commission, sponsored by the Jewish Labor Committee. Burt also served on the planning committee for the California NAACP's 50th anniversary celebration of the U.S. Supreme Court's historic 1954 decision, Brown v. Board of Education. Burt serves on a number of boards, most notably the Harvard Journal of Hispanic Policy and the Edmund G. "Pat" Brown Public Policy Institute at California State University, Los Angeles. The Pat Brown Institute links the university, government, business, labor, and the community in pursuit of innovative policy solutions. Burt is one of the original members of the California Workforce Investment Board. Kenneth Burt is married to Sonia Sotelo Burt. They live in Sacramento with their two children, Stephen and Kate.